Find Sand Castle on the Beach - Adults Only deals, discounts and special offers. 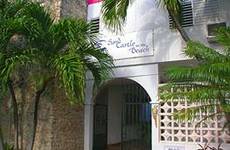 Divi Carina Bay has casino, 1,000-foot beach, 2 restaurants, 2 bars, water sports center, five-star dive center. Small historical King Christian hotel has extensive renovations, bright tropical rooms, fresh water pool. Surrounded by lush mountains and ocean, Carambola Beach Resort has twenty-six 2-story buildings, secluded setting. 53 room Hotel on the Cay is on a sandy beach; spacious air-conditioned rooms, fresh water swimming pool. This historic oceanfront resort offers golf, tennis, complimentary water activities, and a day spa. Located on a hillside overlooking the Caribbean, this hotel next to a natural perserve features 30 cottages for guests.